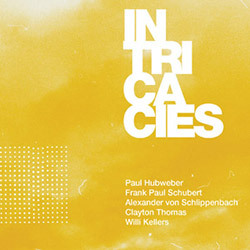 Intricacies' two CDs comprise the recording of a live set dated February 2014 at Berlin's B-Flat. By glancing at the lineup, one can immediately guess that the jazz played that night could certainly be designed as "free", but not of the ham-handed variety. The level of refinement in the interplay matches the absence of stylistic obligations; technically advanced spurts, flashing light bulbs of instant creation, and appreciable � if rare � immersions in "active pensiveness" are swallowed without flinching. The music flows without actual interruptions: there are in fact only three tracks of mostly energetic pulse, with brief pauses of relative calmness to get some breath. The harmonic glue is furnished by Von Schlippenbach's piano, alternating cultivated disquisitions and transcendent dissonance. Hubweber � one of the finest trombonists around � confirms his status with a performance halfway through semi-disciplined and politically incorrect, emerging here and there with unannounced caustic fragments. Schubert's alto and soprano saxophones constitute the link to the traditional (so to speak) aspects of jazz-related improvisation. His will to join the collective fervor equals an impressive proficiency; his solos are much less predictable than most of what's heard today in similar settings. The rhythm section � Thomas on bass, Keller on drums � is impeccable in its spicy yet robust support of a perennially unsettled acoustic matter, also adding two beautifully individual voices to the overall expressiveness when needed. Besides the communal enthusiasm, the attentive ears will perk up during sections where smaller instrumental combinations produce intelligent exchanges of opinions. Accents of more typical playing do appear on occasion, but they're soon forgotten thanks to the players' sense of moving from the same spot after a few instants. Scenes change, timbres mesh, spontaneous mayhem arises, pompous declamations are neither present nor necessary. Perhaps the lone thing that's missing is a pinch of authentic suffering, but it's not so important after all. Just enjoy five excellent musicians at work, and relax: sometimes, that's all you need.